FILE - A police officer stands guard at the entrance of the Ataturk airport in Istanbul, Turkey, June 29, 2016. A source inside the small North Caucasus Muslim diaspora in Turkey told VOA that Airat Vakhitov, who spent two years in the Guantanamo Bay detention facility after he was captured by U.S. forces in Afghanistan in 2001, was arrested Tuesday. VOA has no confirmation of his arrest from Turkey's government. On Tuesday, Western media quoted Turkish government officials as saying the nation's security services had arrested 30 people suspected of involvement in the terrorist attack, which Ankara believes was the work of the Islamic State (IS) group. According to Turkish government sources, 11 of those arrested are Russian citizens. Salman Sever, spokesman for the Association of the Russian-Speaking Muhajir in Turkey, which also goes by the name Union of Honor (Soyuz Chesti) and to which Vakhitov belongs, confirmed Vakhitov's arrest in an interview with VOA via Skype. Russia's security services have accused Vakhitov of fighting in Syria and Iraq alongside terrorist groups, as well as recruiting foreign fighters for IS and other groups, and raising funds for terrorists. FILE - Russian Muslim Airat Vakhitov speaks at a news conference in Moscow, June 28, 2005. Sever denied allegations against Vakhitov. "He never fought in Syria or Iraq, he was never part of IS, he was involved in humanitarian activities for the Syrian people," he said. Airat Vakhitov, a k a Salman Bulgarsky, is actively involved in social media campaigns that are often described as aid groups for the Syrian people, who are suffering in the cross hairs of the Bashar al-Assad regime and IS. However, his social network activities are systematically limited by the network's security, forcing him to frequently change his Facebook and Twitter nicknames and open new accounts. However, in 2005 — a year after his release — Vakhitov was arrested by the special operations group of the Russian Federal Security Service, then was released without charges after almost two months in detention. 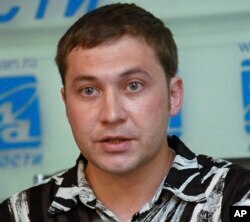 Once freed, Vakhitov left Russia and received asylum in the Middle East, renouncing his Russian citizenship. Information on his country of citizenship is not publicly available. Vakhitov spoke at the Amnesty International summit in London in 2005, sharing memories of his time as a prisoner in Guantanamo and the interrogation methods of U.S. security that he called "torture." FILE - In this photo made from a video, people believed to be the attackers walk in Istanbul's Ataturk airport, June 28, 2016. Vakhitov later spoke about Guantanamo in a series of YouTube videos, in which he discussed the "American torture" in a mocking tones, comparing the methods with those used by Russian security. In one video, Vakhitov said the Americans tortured him and other detainees with "temptation," sending "exceptionally beautiful women" as interrogators. In the video, he said Russian torture is more physical and rough. According to VOA sources in the Russian-speaking Muslim diaspora, Vakhidov lived in Istanbul in recent years, but frequently traveled. In the aftermath of the terrorist attack that killed more than 40 people and wounded another 260, Russia and Turkey announced closer security cooperation in fighting against terrorism. For the last decade, Turkey has become a place of asylum for the rising number of Russia's Muslim immigrants who escape Russia to seek refuge in a "less hostile" country, the International Crisis Group reports. ICG estimates the Russian-speaking Muslim diaspora in Turkey at around 7,000 people. Some of them are experienced in fighting against Russian forces in the ongoing conflict in the North Caucasus region. On Tuesday, the Kremlin-appointed head of Chechnya, Ramzan Kadyrov, posted on his Instagram account the names of 13 Chechens, demanding their extradition from Turkey. Kadyrov calls them terrorists. 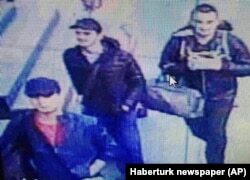 The name of a Chechen IS fighter surfaced earlier in Turkish media, which identified Akhmed Chataev as the mastermind of the Istanbul attack.